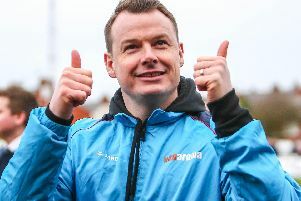 This crushing defeat marking new York manager Steve Watson’s home debut once again illustrated Chorley’s goalscoring prowess as the league leaders hit four for the sixth time this season. Much of this highly entertaining game provided end-to-end fare and although York twice hit the post it was the visitors whose attacks generally carried the greater conviction. In the end, the title chasers might easily have extended their winning margin. Chorley built the platform for victory with two early goals. On eight minutes home keeper Adam Bartlett flapped unsuccessfully at an Adam Blakeman corner in the jaws of goal and Scott Leather nudged the ball into the net. Then in the 16th minute a Courtney Meppen-Walter free-kick deflected off the defensive wall, completely wrong-footing Bartlett as it found the net. Moments after the opening goal, City should have equalised but Jordan Burrow at the back post could only head a looping cross against the upright. York were well in the game and Joe Tait saw a good effort clear the Chorley bar. The hosts were thrown a life-line when the referee spotted a push in the Chorley penalty area at a corner on 34 minutes. Matt Urwin was unlucky, diving to save Burrow’s penalty only for the striker to tuck away the loose ball. York’s defending was erratic and Bartlett at one point had to head clear to deny the lurking Marcus Carver following an Elliot Newby shot. City began the second half with great purpose and Josh O’Keefe was fortunate not to slice a clearance into his own net. But the Magpies were soon back on the offensive and Bartlett twice saved from Carver. The keeper later pulled off a stunning save to keep out a bullet-header from Josh Wilson at point-blank range. Wilson, however, was not to be denied as on 76 minutes he headed home Chorley’s third from a superb Matt Challoner cross. As York kept plugging away, Tait headed against the post but once again the Magpies showed them the way on 83 minutes. Substitute Adam McGurk’s cross-shot was deflected onto the post by Carver and Alex Newby was on hand to tap in the rebound to the delight of close on 300 Chorley fans in a crowd of 2,669. It had been a hard lesson for Watson and his Minstermen who had their moments but lacked the clinical finish of their feisty visitors who stretched their unbeaten run to seven matches and stay four points clear of Stockport County at the top of the table with a game in hand. CHORLEY : Urwin, Challoner, Blakeman, Teague, Leather, Meppen-Walter, A. Newby (Hooper,86), O’Keefe, Carver, Wilson (McGurk,81), E.Newby (Cottrell,85). Unused subs. Jordan, Eccles.